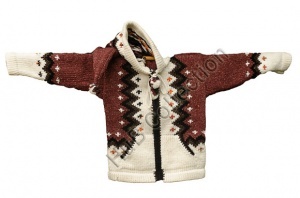 This HuB Collection sweater is made from 50% cotton and 50% wool, it is very soft as well as practical. It is handcrafted in South America and has a full length zip which is very convenient and a 'pixie' hood which complements the original design. Size 4 for age 4/5. Free postage & packing for all orders from UK, NI and Channel Isles.